The church building dates back to 1960. Few buildings in the western communities are as iconic as the beautiful little church with the soaring white steeple near the south end of Royal Palm Beach Blvd., formerly known as Royal Palm Covenant Church. 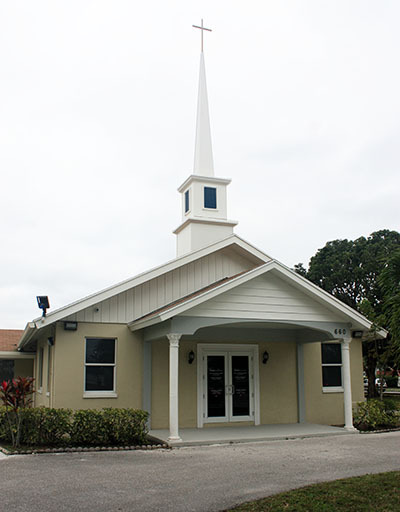 The church was built in 1960, shortly after the Village of Royal Palm Beach was incorporated. But hurricane damage to the building and mounting debt caused Royal Palm Covenant Church to move out several years ago, and the property was bought in 2016 by Wellington businessman and entrepreneur Sheldon Mickelson for $1.8 million. Last week, the Royal Palm Beach Planning & Zoning Commission unanimously recommended approval for a site plan modification and architectural approval for the 1.22-acre site that significantly upgrades the church’s grounds and landscaping. “The cost of the board’s recommended landscaping and outdoor upgrades will be about $113,000, which is in addition to the approximately half a million dollars I already spent on interior upgrades and refurbishing,” Mickelson explained. In its early days, as the village’s first house of worship, the modest building that holds about 200 worshipers was lent out to other local area congregations and synagogues until they could build their own places of worship. The church fell on hard times after hurricanes Jeanne, Frances and Wilma did roof and steeple damage. The culturally diverse congregation, cash strapped during the lean years, was unable to afford maintenance and repair. Before moving, the church was the site of one of the area’s busiest food pantries, dedicated to serving the neediest residents for the prior 15 years. Mickelson currently leases out the property as a chapel and offices for a Missouri-based megachurch with six locations and attendance of up to 28,000 a week, making it America’s 53rd largest church, according to its web site. The pastor of the Royal Palm Beach chapel is the 29-year-old son of the Missouri church’s founders. 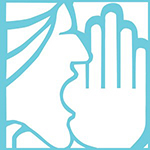 The Planning & Zoning Commission also recommended approval of new signage outside the church that will advertise the present occupants, Amazing Grace Family Church Inc., as FaithChurch.Com Chapel. Board members thanked the owners for agreeing to maintain some grass parking instead of paved parking. “When I bought this place, I was about to upgrade the landscaping and pave the parking lot, but we had to go through this site planning process, and the village told me that they like green spaces and preferred that some of our parking, next to the park, remain grass,” Mickelson said. Village officials said a portion of parking for churches is allowed to be grass, because most spaces are only used weekly. With four campus locations in the St. Louis area, and two in Palm Beach County, Faith Church has been called one of the most influential churches in America. It’s a family organization where the founder, his wife, their son and daughter-in-law are all pastors. The church relies heavily on technology and social media to grow. The Royal Palm Beach location already has a staff of 11 and started offering weekly services earlier this month. The updated site plan, recommended for approval by village staff and the Planning & Zoning Commission, will next go before the Royal Palm Beach Village Council for final approval.